It is a cavity detection device that uses trans-illumination technology to see through teeth and identify lesions and cracks. 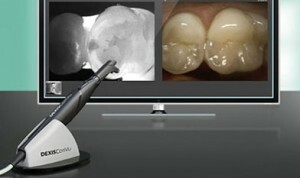 Simply, CariVu is a zero radiation cavity detector where images are read like normal Dental X-rays. “It is easier to now explain to a patient why certain treatments are necessary, as the CariVu shows them what they need to see”. CariVu makes cracks in teeth appear like “shattered” glass and it is excellent at detecting dental decay around fillings. It does not yield any false positives if plaque or calculus is present on the tooth. Absolutely! Since there is zero radiation emitted, it is perfectly safe for children, pregnant women and patients who are X-ray averse.